Looking for the Right Professional for your Cosmetic Facial Injectables? Read about Dr Jamie below. Why are dentists doing cosmetic injectables? Let’s start by addressing the elephant in the room- a dentist carrying out cosmetic facial procedures- what’s that about? Well, in the UK dentists have become the go to medical professional for these services, and when you think about it, it makes sense. A dentist’s training is all about the anatomy, physiology and functioning of the head and neck region: they have a very keen aesthetic eye and are excellent are discerning imbalances, symmetry and harmony; their clinics are held to the highest possible account for sterilization and disinfection procedures. Of course, this isn’t standard dentist training at dental school, so the dentist must undertake comprehensive further study in order to be able to offer these treatments to their patients. Why consider Dr Jamie for your treatments? Dr Jamie is a trainer with AADFA- The Australasian Academy of dento-facial aesthetics… Australia’s most recognized and highly regarded dentist- training program in the field of cosmetic injectibles and facial rejuvenation. What does a trainer mean? Well basically, Dr Jamie travels around Australia and New Zealand helping the Academy to train dentists who are interested developing their interests and expertise in this field. As we all know, perfection is an illusive dream, but… that perfectionist streak runs deeply in his veins, and when combined with his care, integrity and genuine passion, you’re in safe hands. Obviously, we live in Australia, where 2 in 3 patients before the age of 75 get some form of skin cancer and since you see you visit regularly (or should do…) for dental check ups- more so than you see your GP, and you have probably never seen a dermatologist- we think it’s important to check out your skin, pointing out anything suspicious; this should be part of your examination. We also have patients who now visit us, to improve their skin condition and skin health, enabling a more youthful look. These procedures, however, are now becoming part of our everyday check-ups. Everyone wants a great white smile; smooth, hydrated, vibrant, glowing skin screams health and well-being. It will benefit your whole body, as well as have you feeling confident and attractive. Who is it for? And when should you start? In much the same way that prevention is better than cure for your teeth, healthy skin habits that are adopted early, will stop the health of your skin deteriorating, minimising the effects of age. In fact, fast-forward a couple of decades and the differences can be truly dramatic. Under the age of thirty, the key is an appropriate quality skin care regime that employs scientifically proven ingredients such AHA’s or BHA’s, vitamin C, Niacinamide (Vit B5), Hyaluronic acid, Vitamin A (retinol) + peptides, proven anti- oxidants to resist free radical damage and of course and incredibly importantly sunscreen- which you should be wearing everyday by the way, even if its rainy and cloudy! Everything starts to slow down a bit when you are in your 30’s and 40’s and this is where supplementing your home regime with some rejuvenation therapies such as micro-needling and chemical peels can help stimulate collagen and elastin. It is also around this time that fine lines start to appear at rest, rather than simply when you smile or frown; this is where botox can help, by reducing the overactive muscle activity that causes these hyper-dynamic lines. We can soften and smooth out- sometimes eliminate altogether- these lines. In your 50’s- 60’s the skin loses its thickness; cell turnover slows further and there’s a redistribution of fat and loss of muscle tone. The face begins to sag and skeletal bone remodelling also occurs. Here we may need to layer in additional filler, botox and even use thread lifts to lift everything back up. Dentists have some excellent tools to reverse and slow the natural course of aging! What about men and skincare? I always respond to this question first by stat the obvious – Men have skin too! Actually males are the largest growing area for these treatments: all the same rules apply- although men tend to have slightly thicker skin, which loses collagen and elastin more slowly than their female counterparts. Yes, men have get botox- far more than you imagine; they also have fillers and extensive home care regimes. The days of “It’s not masculine to wear moisturiser,” are long gone. What should, and shouldn’t you, be using on your skin? This is a much longer conversation: In a nutshell, cleanse, moisturize and apply sunscreen in the morning; just cleanse and moisturize in the evening. If you have been using soap in the shower- this is where to start- just make sure you are using a decent product, not expensive products, but those which contain the correct ingredients. Those of you who already do this, can take have a few steps further; you can layer in some anti-oxidants and active ingredients after cleansing which will give your skin an incredible and visible boost. If you would like more information on my recommended skincare regime, then please sign up for my report below. What can go wrong with facial injectables? The answer, of course, is a few things can go wrong: any procedure we carry out can have complications, as with any medical professional. The key to success is to minimise your risk: ensure that you put yourself in an appropriately trained, experienced and insured individual. The good news is most issues can be dissolved, dealt with, or will wear off in a few months. There is a phrase we say use in the Academy, “If you can’t prescribe it, you shouldn’t do it” and whilst legislation doesn’t yet honour this mantra, as cosmetic/beauty practices become ever more popular… and complications occur, I believe it is certainly something we’ll see in the near future. What is the essence of Dr Jamie’s philosophy? Many cosmetic doctors base their philosophies on making you look as good as possible…seems fine in principle…but it misses a key element that underpins everything Dr Jamie stands for- Health. Let’s take skin for example: the largest organ in the body and the barrier between you and the outside world. Sure you could place some botox and filler and get a good-looking result. But if you took the time to get the skin turning over optimally, restoring it to its peak physiological condition, you would as a by-product, create a properly functioning and healthy barrier… skin that glows and looks amazing. Not only that, but the results, together with a few additional treatments, will be amplified multiple times. So sure, you can pop in and get your botox -as you always have- or you can take advantage of the skills and knowledge that Dr Jamie brings to the table. As with dentistry- if you treat the cause, not just the symptom- the long term health and aesthetic benefits will be vastly superior… who doesn’t want to delay the onset of aging, look amazing and glow with health! Layered in over time, a combination of a quality skin regime, rejuvenation therapies such as micro-needling or chemical peels and strategic use of botox, filler and threads (if required) can have beautiful and significant results. Does Dr Jamie use botox himself? Good question… Indeed he does: “ As I age, why wouldn’t I want my skin to look as youthful, and be as healthy as possible?? Facial injectabiles/ cosmetic injectables: What procedures do they include? Essentially cosmetic injectibles or facial injectibles are the same thing: including both dermal fillers and anti-wrinkle injections (think Botox or disport). Anti-wrinkle injections reduce lines from muscle contraction – most commonly in the glabella region (between the eyes and brow), the forehead and the crow’s feet. 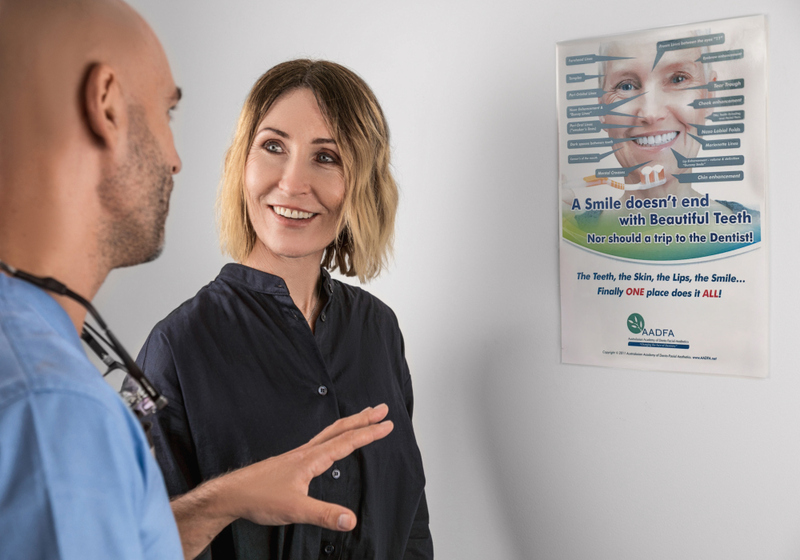 Additionally, we can also treat a gummy smile very easily, often with amazing and dramatic results… including as a side effect, the slimming of the jaw-line and also a reduction in any pain caused by clenching and grinding. We can upturn the corners of the mouth, reduce over active chin muscles, bunny lines and often treat the neck (platysma muscle) to stop it pulling the face south especially in combination with lifting procedures. With reference to facial fillers, we can use these to reduce shadows and deficiencies that occur with time: common areas include the tear trough (under eye), nasio-labial folds and marionette lines. We can also correct and enhance other parts of the face as required and this includes noses, chins and jaws and cheeks. Do you offer any other procedures? We also carry out micro-needling and chemical peels: soon we will be able to offer PRP and CGF… harvesting stem cells and growth factor from your own blood via centrifugation and then using this product to give the ultimate rejuvenation boost to your skin. We can perform thread lifts: a simple non-surgical lift to reverse the gravitational changes that have taken place, or. We can insert mono threads to boost collagen regeneration. An important question: we only use the finest quality products. For filler we use the excellent Teosyl Range which comes in a range of densities for different layers of the dermis and lips. For botulinium toxin (think Botox) we use ‘Disport’ as opposed to Botox (which is actually the trade name of another manufacturer) – same protein and effect- just a different dilution ratio. For home care regimes, we use the professional cosmeceuticals from SkincareRx, as well as some prescription medicines for specific conditions. Dr Jamie will guide you through the whole process and make sure you have all your questions answered; make sure you are fully informed of the options; and make sure you know exactly what each treatment involves. He will take some photos of various angles and expressions, examine your skin health, structure, facial proportions and listen to want you are trying to improve or achieve. It is important that your expectations can be met by the various treatment modalities we offer. He will delve into your home care regime and talk you through the process – not just the products you apply – but the lifestyle factors that impact on the health of your skin. But can I just get botoxTM? That’s OK – we can provide that service for you – but as a medical professional, we are required to form a diagnosis and inform you of your options. If after your diagnosis, you just want botox… so be it. However, we would hope you would be curious enough, to want best possible outcome for the health and appearance of your skin. Can I get my treatment at my check up? Dr Jamie will want to sit down with you initially and comprehensively discuss your needs, but once you are on maintenance plan, then treatment can simply be added at the end of your dental check up. Most of our patients follow this procedure. Click here to see our facial rejuvenation and cosmetic injectable price list. Opt in to our newsletter for scientifically backed skincare tips once per month.